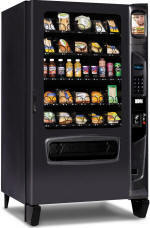 The 30 selection Chill Center E is designed to provide the best refrigerated food service available. A wide variety of packaged meals, sandwiches, salads, dairy, fresh fruit & beverages are softly served via a patented elevator delivery. Equipped with the latest "guaranteed or your money back" delivery system, it will accept any combination of bills ($1, $5, $10, $20) and coins (5¢, 10¢, 25¢, 50¢, $1) and makes change. An optional Wireless Credit/Debit Card Reader is also available.